Announced at the Consumer Electronics Show (CES) in Las Vegas in January, the PowerShot G9 X Mark II is the successor to the original model of the same name introduced in October 2015. 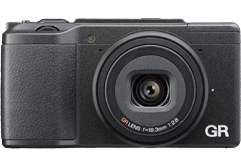 Although marketed as a premium model, the G9 X is in fact the entry-level variant in the company’s lineup of cameras using the 1-inch type CMOS sensor. While the G7 X, G5 X, and G3 X models also use the 1-inch type sensor, they are more expensive and they’re also larger: the G9 X is still the most pocket-friendly model available of its type. As a high-end compact with the focus on portability and high image quality, the original Ricoh GR was a highly-regarded model. Adding Wi-Fi connectivity, improved buffering, and extended battery life to the original’s GR 28mm-equivalent f/2.8 lens in front of a relatively large APS-C type 16-Mpix CMOS sensor, the Ricoh GR II is a relatively modest update. Read on to find out how well this new camera performs.